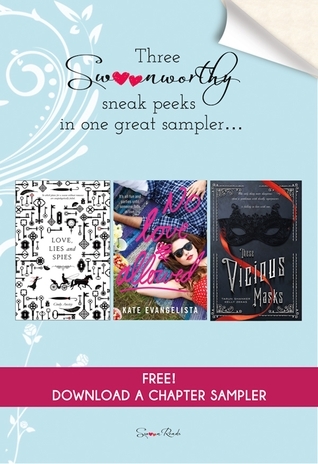 Is it kind of cheating that I read a sampler for three YA novels and marking it for my Goodreads Reading Challenge? I'm a huge fan of Swoon Reads and the books they have published, doing promotional blog tours for a few releases by them is a time I've really enjoyed as a blogger and with more dates coming up, very excited to read some new releases! Even though this sampler was released a few years ago, its no secret that I really want to get my hands on all three books that were featured because there was something about each other that really pulled me in.Love, Lies and Spies: *Coughs* I love spy stories, adventure, regency, I mean, this is literally my bookish loves summed up and put together in a single book. The extract about the locket and its hidden mystery really wanted to keep me reading on.No Love Allowed: I was actually part of the blog tour a long time ago for another book in this series called No Holding Back which was a M/M Romance I really enjoyed. Some trigger warnings in this extract for Suicide/Medication so bare in mind if you would like to read this one. Caleb needs a fake girlfriend to avoid losing his freedom and being shipped off to College.These Vicious Masks: First, I adore co-written novels so seeing this one described on Twitter as X-Men meets Pride and Prejudice, I'm sold! The extract I read left me on the edge of my seat but the parents of the main character were extremely stubborn which I wasn't keen on.Overall, gimme the books! Hopefully at some point in 2018, I would love to leave full reviews on them all. Whew, I needed a break from reading about North Korean prison camps. * * * * *All of these books were very good. I was disappointed to find, though, that all three were excerpts that ended in cliffhangers, so I'll have to buy the separate books to find out what happens. They were all RO-mance related, but not sickeningly so, and all were intriguing enough to continue reading. Cindy Anstey Kate Evangelista Tarun Shanker Kelly Zekas - Whenever she is not sitting at the computer, throwing a ball in the backyard, gardening or reading, Cindy can be found--actually, not found--adventuring around the world with her hubby. She has lived on three continents, had a monkey in her yard and a scorpion under her sink, dwelt among castles and canals, enjoyed the jazz of Beale St and attempted to speak French. Cindy loves history, mystery and a chocolate Labrador called Chester. Love, Lies and Spies is her debut novel.